Robert has done a great job on the preamp. In my humble view, this is one of the best 3 preamplifiers in the world ever. Two thumbs up! It is an art. Whar are the other two? Maestro, being the owner of K10, my guess/vote on the other two are: Tidal Presencio and DaVinci Master Virtu. What is your current preamplifier in your system? Which one is the best or not depends on subjective llistening preferences. Given my preference is neutrality, I believe the very best of the best out there is Tidal's flagship Prescenio. Resolution means endless layers of information on all dimensionality. To me, this means musicality. Musicality is subjective. You may like Goldmund. He may like FM. She may like Boulder. Although I read Mr.Zanden's clash of Titan with great interest and respect, his conclusion only represents his own preferences. My musicality comes from ultimate resolution. If I want to enjoy real live music, I will go to attend concerts. At home, I am recreating a High Fidelity experiences that must constitute a believable sound staging and imaging together with speed and articulation of rhythm. Based on what I subjectively like, Tidal Prescenio is the best. What are your views on Tidal Prescenio vs Kondo M 1000 vs Robert Koda K-10? You are dragging me into a dispute territory. 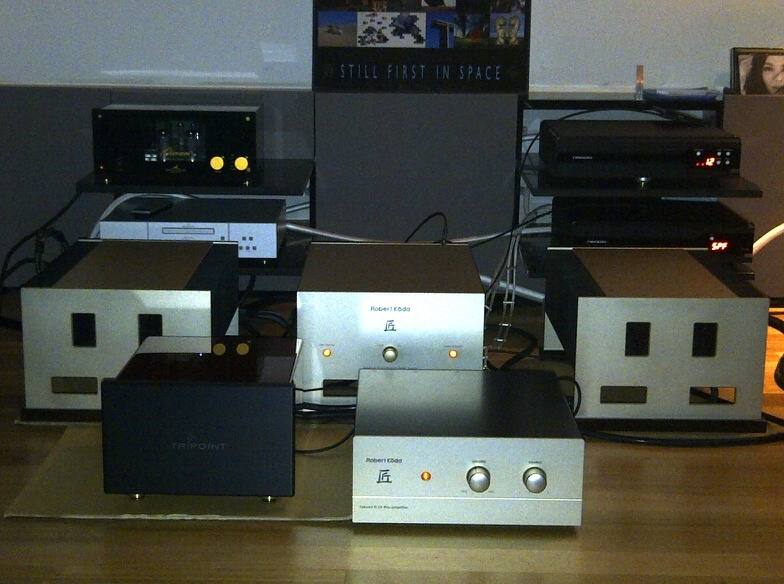 As I said, it is the taste that dictates the choice of these pre-amplifiers. The listening culture here in Taipei may be different than Hong Kong as well. A little bit more background of myself, I am going to turn 58 this year. Brand name and hi fi reviews to me mean NOTHING. If one is telling me using Kondo M1000 with 300B amplifier driving inefficient speakers, I'll keep my mouth silent. The higher the price of the preamp, the more critical I am. Kondo M1000 retails for more than USD110,000 now in Hong Kong. At this price, assuming 40% discount off retail which is what most HK retailers do, the justifications are not there. It is a very good tube preamplifier in its own right if you like pastel-like tonality. The high frequency is pleasing, mid range is poisoning but bass clarity is not to up to the standard. If pastel like resolution means musicality, then the M1000 is unique. It is like buying a painting. You can pay USD1 million for the Monet or USD2 million for Van Gough. Who is better? No answer. Subjective preference dictates. Robert's K10 can do everything what the M1000 does. The only difference is much cheaper. It may not be able to satisfy people's consumerism ego. Clarity across the frequency spectrum is much better, but tube fanatics would say it is solid state. But frankly speaking, in a closed blind testing session of 9 people conducted here, many mistaken the K10 is a tube preamplifier because harmonic information is much more than many tube counterparts. Tube people may not like speed. If the speed is fast, some say tonality is not right and the taste is gone. I don't buy that. Robert worked for Kondo san before. I can still find traces of his influence in his works. I am glad that he is able to free himself from the Kondo tonality. Otherwise, he always lives under his shadow. Robert definitely has his views on musicality. The K10 carries his view too. Put it this way, I believe the K10 bridges the gap between "high fidelity" and "musicality" like no other solid state design has done before. Don't trust this old man, maestro. Look at the result how many people are using K10 here with minimal advertisement everywhere else. The AE group has done their homework. The Tidal Prescenio is purely "high fidelity". I speculate it is least preferred by Japanese tube school fanatics. Many would label it as the German camp. I also don't buy this claim. It is the only preamp that I know the designer's musical will is completely removed from the preamplifier. This is difficult. One needs a long time to understand it. The acoustics haver to be correct, the cables must be right and even the vibration control management has to be well sought out because the Tidal is going to tell you what's wrong. The neutrality, which defines transparency, is unique and to me it is groundbreaking. Don't test with a single vocal to look for the same tonality from tube, you will be disappointed if you test it this way. Play piano at least to start with. If there is another preamplifier that does justice to the reproduction of piano after you listened to the Tidal suite, please tell me. Because there is none that is capable doing the same to my knowledge and I have practically tested everything out there. If there is another preamplifier that can reveal layers and layers of information from symphony and orchestra with precise and palpable imaging front-to-back, left-to-right, please let me know too. Most preamplifiers start sounding diffuse at full crescendo as it cannot hold everything together in place without distortion. The Tidal can do this perfectly at all positions of the volume control, provided your room can take the loudness. My goal as an audiophile is less aggressive than many. It is not my goal to recreate a live music experience in my mansion. I know I will never be able to do that. For live consumption of real music, I can always go to the concert hall. I will be satisfied with I can recreate a believable soundstage that is proportional to the size of my room and imaging quality that is palpable enough for me to feel as if they are in front of me. When these are achieved, my spine will be thrilled. More often than not, if these are not right, the tonality is not right in my experiences. To me, the Prescenio is just like an audio textbook, I'm starting to learn again from the beginning. What were your prior praemplifiers? Thank you for great and strong text. It seems, that not enough people know about Rober Koda and Tidal peformance? Can you guys kindly tell what impressed you so much about Rober Koda K-10? The Da Vinci Virtu also belongs to the masterpiece class. I got a feeling of listening to a passive preamp, however, with tremendous dynamic. Like Robert's K10, the approach to music is holistic. The old vintage da Vinci signature sound akin to western electric is gone almost completely - that is good. In exchange, more speed and resolution are rewarded. Textures remain rich but not overly inflated like the predecessors. The sound staging develops naturally on all axis. It takes awhile for me to dial in. For extreme fine details, it is still a notch below Tidal Prescenio. But the "German" camp as Jeff suggests somewhat stereotyped the Tidal. The Tidal is definitely not the conventional German camp. But you just need a long long time to understand it at your own system. I like the description of "audio textbook". My answers are: contrasts of tonal color, articulation of bass lines, natural rendering of the midrange, natural development of harmonic decay. There is no "highlight" on the high frequency areas. Transients are resolutely vivid. There is a thread on K10 here with plentry of actual users comments. I beg all of them bought it without listening. This is a very fine system evidenced by Robert's two masterpiece of works: the Takumi K10 linestage and the Takumi K70 power amplifier. The source is Neodio's CDT and DAC. All ground noises are cleaned by the Troy. People who had listened to these components in separate occasions should be able to imagine the fine details and the rich texture when they are now put working hand in hand in the same system. Robert is happy to do on site upgrade (a small technical upgrade)for Takumi K10/K70 users. Great system. What is the role of Shindo in the back?